Want to lose weight, keep your lean muscle and be race ready? While diet and exercise are the best ways to get there, everyone could a little extra help from a supplement like ThermoLean®. Developed especially for two-time Olympic gold medallist and endurance athlete, James Cracknell, ThermoLean® is a powerful combination of the most effective and well researched weight loss ingredients, including calcium, caffeine, chromium, green coffee and green tea, alpha lipoic acid, choline and more. While ThermoLean® is proven to be a highly effective fat burner, it can also optimise your performance by reducing tiredness and fatigue, supporting energy production and sustaining mental performance. It’s this powering up effect that gave rise to the battery-like design of ThermoLean® and the rest of the Activeman range. Activeman ThermoLean® is a high performance fat burner, engineered by Bio-Synergy and James Cracknell to help you strip away body fat and reach your ideal racing weight. ThermoLean® is the result of our relentless search for the world’s the most effective yet natural fat burning ingredients, backed by reliable scientific studies from reputable institutions. We picked the top 10 and combined them into one product. Our patented formula starts with green tea, green coffee and caffeine to boost your metabolism, enhancing your body’s ability to burn fat while giving you an energy surge. We also included high doses of calcium and copper, which contribute to energy yielding metabolism, meaning they help your body turn fat into energy. Zinc and alpha lipoic acid are also included as they contribute to protein, carbohydrate and fat metabolism, ensuring these macronutrients from food are used for energy and don’t become body fat. You also get a dose of chromium, which supports the maintenance of normal blood glucose levels, and can curb your sugar cravings. As you can see, ThermoLean is packed full of micronutrients that are designed to burn fat, boost your energy levels and power you to a PB performance. IS THERMOLEAN® RIGHT FOR YOU? If you’re an endurance sportsman – runner, triathlete, rower, cyclist or adventurer – and you’re trying to get lean, then the answer is yes. Whether you’re at the front or back of the pack, you can better your performance by improving your power-to-weight ratio. As you’ve read above, our formula is bursting with ingredients that are designed to help you strip away body fat while maintaining your lean muscle. With ThermoLean’s ability to lift your energy levels, we suggest trying it just before big training sessions. LOOKING FOR OTHER PERFORMANCE PRODUCTS AND FAT BURNERS? You’ll find a wide range of options from Bio-Synergy, including Activeman Oatein, Activeman Energy Charge, Body Perfect, Insanity, BCAA Powder, Matcha Green Tea Powder and many others. We’ve sourced the finest quality nutrients from the UK to achieve a premium quality content that is hard to match. As with all products made by Bio-Synergy, Thermo Lean is produced right here in the UK, so you know you’re getting the finest quality supplements. Calcium Carbonate, Green Coffee Extract, Gelatin (Capsule Shell), Green Tea Extract, Cinnamon, Choline Bitartrate, Alpha Lipoic Acid, Caffeine, Zinc Oxide, Magnesium Stearate, Silicon Dioxide, Copper Citrate, Chromium Picolinate. Take two capsules a day before meals with a glass of water. Most customers report noticing results within one month. 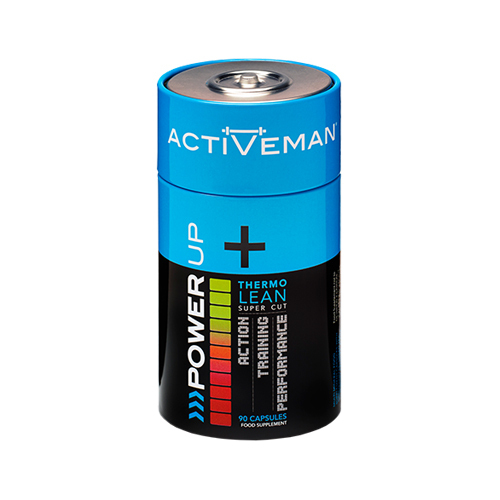 We recommend you don’t use Activeman Thermo Lean® before sleep due to it containing a source of caffeine. "All things considered Thermolean is a very impressive product and easily places itself within our top ranked Fat Burners. 9.5/10 - UK Supplement Reviews"